Fern Bank Cottage is so special our guests often call us upon check-in to let us know how awed they are! 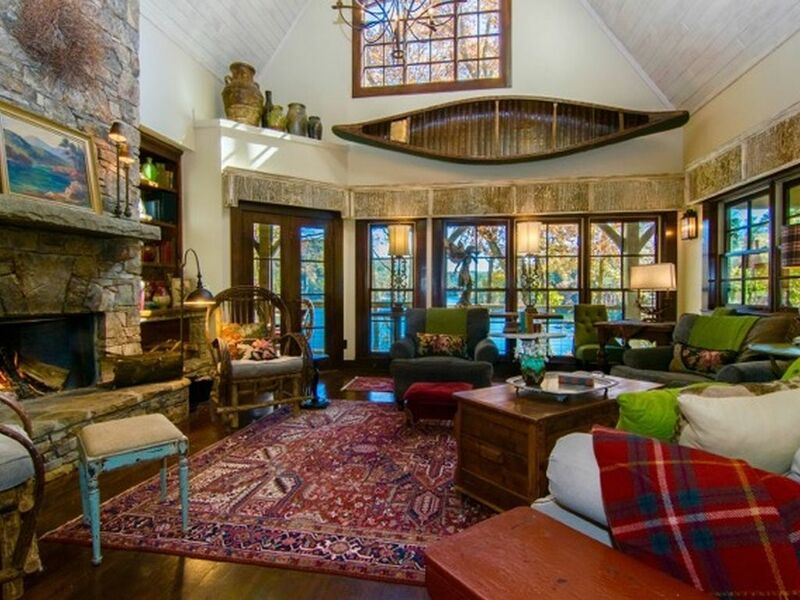 This is a gorgeous mountain home nestled in the trees and close to the lake. Every bedroom and living area in this comfortable cottage is graced with astonishing lake views. This fabulous vacation home accommodates several couples or families with its many bedrooms and living areas, yet is perfect and romantic for two. Decorated with an air of rustic elegance, the main level of the cottage provides all any guest could desire, with cathedral ceilings, a great kitchen, Master Suite with a jacuzzi and fireplace, hardwood floors throughout, and two wood burning stone fireplaces. In addition to the main level, Fern Bank Cottage has both an upper and lower level that can comfortably accommodate many guests. The upper level has two lovely bedrooms, one with a king size bed and one with twins. Both, of course, have a view of the lake. The lower level has three more bedrooms, two that are perfect for couples and one that is a bunkroom (kids love it!). Towels, luxurious linens, laundry facility and gas grill are provided. Lakeside decking includes open, covered and screened porches that allow for outside dining and reading in any weather. A gentle walk to the lake leads to a private dock on deep water with a canoe included for exploring the lake and its waterfalls. Our lake is quiet and pristine making it wonderful for swimming, fishing, or boating. We are just a short drive to both Cashiers and Highlands where you will find lovely shops and restaurants. The area is called "the land of waterfalls" and provides for many great hikes and drives to waterfalls and breathtaking vistas. Private dock on deep water with a canoe. Fern Bank Cottage is nothing short of spectacular!!! We had 14 family members congregate here for our parents' 50th anniversary, The grounds are immaculate and there was sooooo much space for everyone to be together in one place or have a secluded space in one of the many beautifully appointed rooms or decks. The details like fresh flowers in every space, blankets on the hammocks and chairs, and spices and coffee already in the cabinets were so thoughtful and charming. We were slightly terrified the first turn down the drive, but then it became a wonderful place to get a workout! The lake is a rare gem as well! We rented a boat from a local Bernie recommended, and it was such fun to boat around this pristine lake to see the 3 waterfalls and take the teenagers tubing. The dock was a favorite place for the kids to jump and dive off while us adults simply floated around soaking in the North Carolina sun. Every evening we enjoyed a family dinner on the upper deck where we all fit! This was a special place to take in the morning sun as it came up over the mountain with a cup a coffee. It;s truly a magical place. Our family voted it BEST house rental EVER, and we all want to come back every year! Fern Bank Cottage is wonderful in every way! Fern Bank Cottage is wonderful in every way! My family enjoyed our time there immensley. We loved the view of the lake from the house, bank and dock. We fished, canoed, kayaked and built a fire almost every night. The beautiful house was clean and well maintained and accommodated our family of 12 nicely. This is a large, lovely home with plenty of privacy but close to town. We enjoyed our stay, had good weather and loved eating outdoors while watching/ listening to the birds and hearing an occasional chipmunk scampering through the leaves below. Great views of the lake with good access. We were a party of 4 which allowed us each to have our own room/ bathrooms. There is a marina nearby which rents pontoons. I wish I had known about it to allow those of us too rusty to use a canoe to go exploring this gorgeous lake. Great for couples and families, responsive owner. Picture in your head the perfect cabin by a beautiful lake. Now whatever you imagined, Fern Bank will surpass that image and any expectations you might have had. From the moment you open the door of this cabin, you are enveloped in beauty both inside and out. There is so much thought and care put into the decorating of this home from the comfortable furniture to the varied and lovely art throughout the house. And then the views...you will find yourself constantly drawn to the lake and mountain views and to the wonderful porches with the many sitting areas with comfortable chairs, blankets, and pillows - the perfect place to hang out with a book, a cup of coffee, or play a game of dominos or chess. This lake is a true sensory experience from the feel and smell of the cool mountain air, to the sounds of the birds, frog, and cicadas. Each day brings a different look to the lake -you may wake up to a misty fog, or you may see the reflection of the trees and mountains on the water, or the water sparkling like diamonds. Take a kayak or canoe out onto the water and you are rewarded further with the joy of exploring different parts of the lake including one or more of the gorgeous waterfalls on Lake Glenville. Whatever time you spend here, you will find it will not be enough. You will find yourself not wanting to leave, wanting to see more, wanting to just be there. We have stayed in several cottages on Lake Glenville but none can match what Bernie has accomplished at Fern Bank. The cottage is well laid out for a single couple or a larger group. The views of the lake are outstanding from the numerous porches. The furnishings at Fern Bank are simply magnificent. The kitchen is well equipped and almost anything you can imagine to prepare a fine meal is provided. If you prefer there are numerous restaurants nearby in Cashiers and Highlands. Although Fern Bank can accommodate a large group the rooms retain the intimacy of a finely appointed cabin. The first trip down the driveway may be intimidating but after a few trips it is quite manageable under normal conditions. In short, we highly recommend Fern Bank to anyone wishing to experience the beauty and serenity of Lake Glenville and the surrounding mountains. WOW!! Fern bank was utterly amazing. It was like stepping into the pages of one of those gracious living magazines. Between the wonderful home and the incredible views of the lake, we could not have asked for a more perfect vacation spot. My family had a fantastic time. We thoroughly enjoyed every moment we had there and didn't want to leave. We're already talking about renting the place again when we have our family vacation in 2011. Bernie has a true gift for decorating in such a way as to create a warm and inviting space where visitors can really feel at home. Thank you SO much for putting together and maintaining such a luxurious place. Please call owner for rental fee and reservation and payment instructions before payment.